I went to check out the giant inflatable duck art installation currently on view at Harbour City to see what the fuss is all about. And there it is, floating on water. As with all things crazy in Hong Kong, what was most spectacular is not really the duck, but how many it has appeared on the media as well as how many people were seen photographing the duck on the docks. 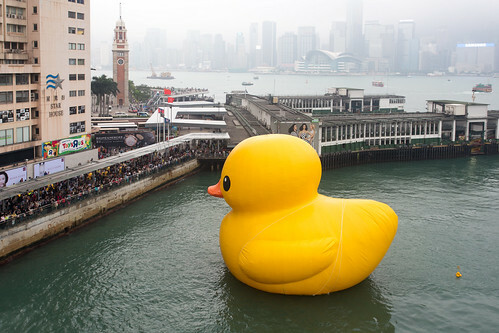 On the evening news in Hong Kong, it was reported that some photographers were pushing each other just to get a space to photograph this floating duck. Oh humans. The best place to photograph this is on the roof of Ocean Terminal where the car park is. There are much less people there and you get to see the duck well. I am claustrophobic so this is obviously where I photographed it.